← Different Levels of Credibility Between Religions? Fuchs’ confusion and mixed feelings were representative of many attendees in the barren parking lot behind the church. The guardian of 5-year-old Pug Pepper insisted that she became “holier” and “more angelic” upon being blessed. Twelve-year-old Dalmatian–black lab mix Spock is “still the same dog” but “gets another year each time,” according to his owner. Spock shook nervously during the ceremony and appeared to be less than enthused. The guardian of 7-year-old Lhasa Apso Buddy said that her family is Catholic and wants to “keep him in the loop.” Buddy immediately shook off the holy water that the priest sprinkled on him. Many Catholic and Episcopalian churches honor the compassionate teachings of St. Francis of Assisi by blessing animals on or near October 4, a feast day in his honor. Whereas many saints are associated with specific animals, Christians revere St. Francis for his love of all animals and consider him the patron saint of animals and the environment. According to the 2008 book Holy Dogs and Asses: Animals in the Christian Tradition, “hundreds, if not thousands” of blessing ceremonies in at least 40 states occur each year. Author Laura Hobgood-Oster notes that the blessings “have probably taken place throughout Christian history.” She attributes their “dramatically” increasing popularity in the late 20th century to the highly publicized blessing spectacle at the Cathedral of St. John the Divine, an Episcopalian church on the Upper West Side. Dogs are the most common nonhuman attendees of blessing ceremonies, writes Hobgood-Oster. This year marks the 800-year anniversary of the founding of the Franciscan Order within the Catholic Church. On September 27, at the “Francis Week” kickoff event at the Church of Saint Francis of Assisi in Midtown Manhattan, several friars praised St. Francis for forming the order that the church is a part of in 1209. St. Francis, of Assisi, Italy, petitioned Pope Innocent III to allow friars to live a more disciplined, ascetic life in accordance with Jesus Christ’s lifestyle and teachings. The order is now known as the Order of Friars Minor. 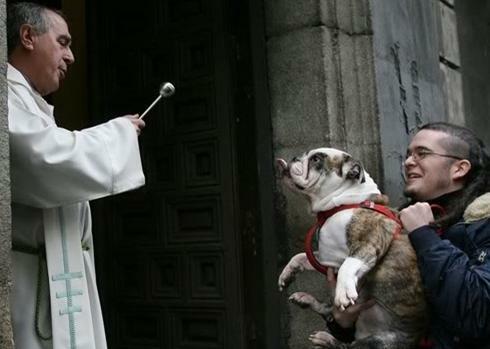 Carnevale stressed that the blessing of the animals is but one component of Francis Week. He emphasized that the Transitus, which commemorates St. Francis’ death, and the feast in his honor should not be overlooked. 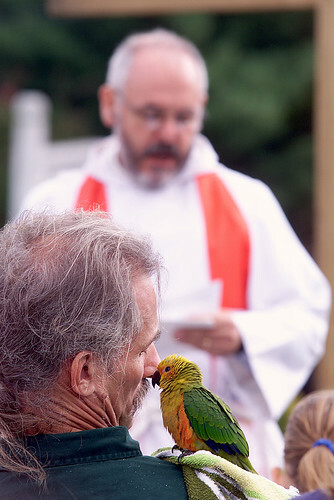 Some attendees thought the ceremony could heal their sick animals. Guy Chiapperini came from the Bronx along with Bluto, a male German shepherd wearing a pink T-shirt. Chiapperini said that Bluto, 6, suffers from kidney failure and undergoes dialysis twice a week. In his own way, Bluto also looked up above, voiced a strong message to a higher authority, and hoped he would be heard. While the other animals stayed mostly quiet during the ceremony, Bluto spent several minutes barking at J.J. the police horse. Michael Croland runs heebnvegan, a blog about Judaism and animal issues. He has won a Genesis Award from The Humane Society of the United States for his articles about animal protection. Read Michael’s account of Jewish Blessing of the Animals ceremonies here.